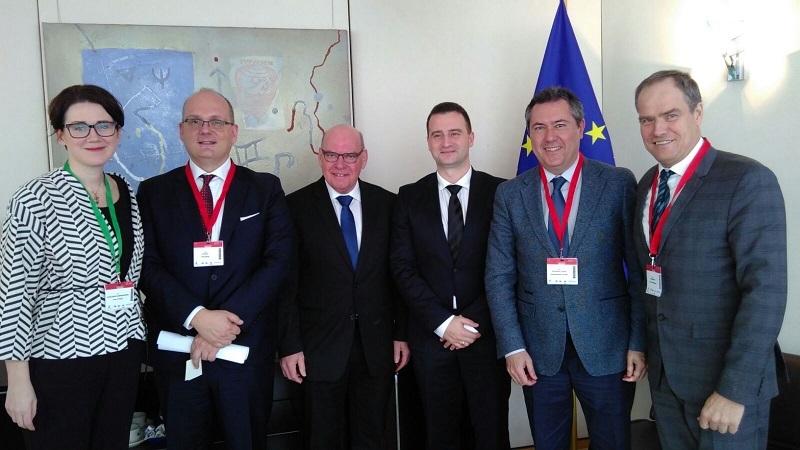 On the sidelines of the 10-year ceremony of the European Covenant of Mayors on the 22nd of February in Brussels, the European Covenant of Mayors Board met with Zhecho Stankov, Bulgarian Deputy-Minister for Energy from the Bulgaria EU Council presidency. Julije Domac, director of REGEA (North-West Croatia Energy Agency), Juan Espadas, mayor of Sevilla, Daniël Termont, mayor of Ghent, Eckart Würzner, lord mayor of Heidelberg, and Åsa Karlsson Björkmarker, deputy mayor of Växjö, represented the Covenant Board and spoke on behalf of 9,000 + European local and regional authorities at the informal gathering. During this fruitful and spontaneous meeting, the members of the European Covenant Board and Zhecho Stankov from the Bulgarian EU presidency held a frank exchange in which they covered a wide range of issues. Stankov was open and receptive to the various needs raised by the Board representatives, especially regarding a full involvement of EU cities on the Bulgarian presidency's agenda, making the Covenant pillar of energy poverty a key priority, and considering a prominent role for local governments in the set-up of the Governance of the EU Energy Union and the governance architecture of the future EU budget for the period after 2020. Regarding the future EU budget, Juan Espadas, mayor of Sevilla, issued a clear proposal to the Bulgarian presidency to improve the effectiveness of EU urban and regional funds: "We need to make sure that EU money is invested in the most effective and coordinated manner at urban and regional level. At the moment, there is a mismatch between big investors seeking to finance large, bankable projects and EU funds often financing too many little projects. Therefore, national investment committees should be set up to evaluate and raise the quality of proposals for local investments, with a focus on financing 10 really strategic, innovative ideas that can be leveraged and replicated across urban areas. EU cities should play a fundamental role in the governance of these committees, as they are best placed to select the right urban projects according to their needs. This mechanism would be a suitable complement to current EU urban and regional policy and contribute to driving the local energy and climate transition." As a follow-up to this meeting, the members of the European Covenant Board will send an official letter to the Bulgarian EU presidency, in order to request an informal hearing of the Board at a meeting of the EU Council of Ministers - which would be an absolute novelty in the EU institutional landscape! Moreover, cities' needs on the Covenant pillar of energy poverty will be gathered and brought to the Bulgarian presidency, in order to improve EU policies on this critical issue. On 19-20 March, the Bulgarian presidency will hold an official event on energy poverty in Sofia, in collaboration with the European Covenant of Mayors Office and Bulgarian Covenant supporter EcoEnergia (Municipal Energy Efficiency Network). Stay tuned in the coming days for more information on this on our event agenda!